Just getting well after another stupid accident where I fractured some ribs, I was now on my way to one of my favourite corners of the Alps. This time I wanted to visit Friuli in the northeast corner of Italy, and the close-by areas in Slovenia and Austria before the summer. I still had to go a bit later than usual as I knew the snow might linger up in the mountains here and I wanted to go up to at least 1600m altitude. 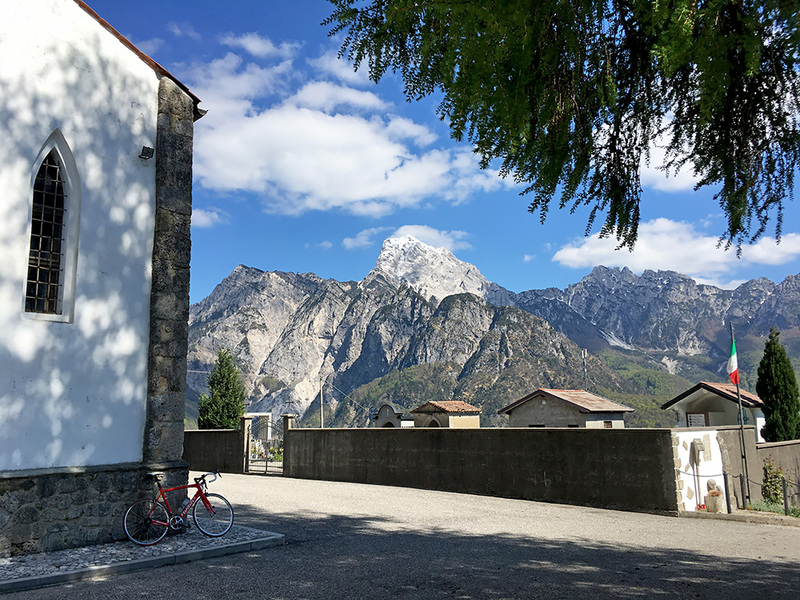 Thus I went down on April 29th to Venice and took the train up via Udine to Moggio Udinese/Mueç, where I stayed at a very good bed & breakfast that I had stayed at before on two different summer tours. The first photo is taken just outside the Rosa dei Venti B&B. 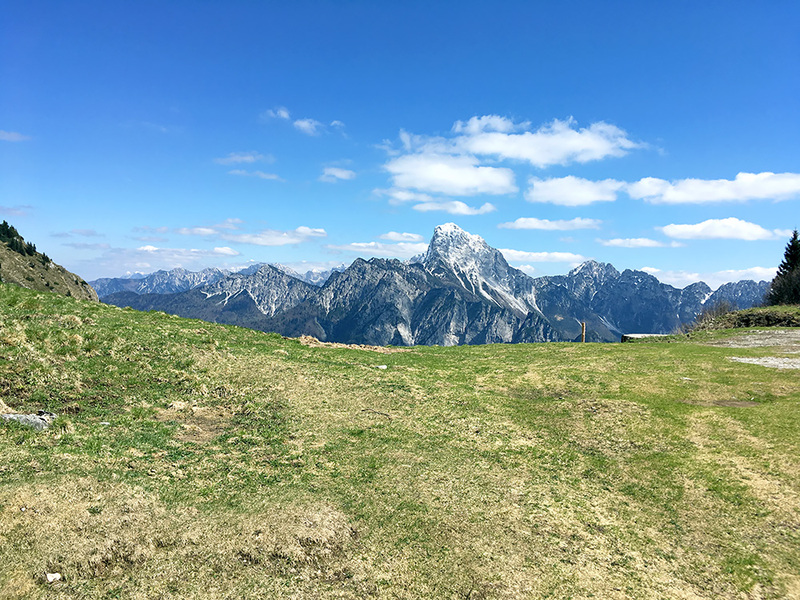 I do not bother to summarize the number of kilometres and height metres this time as it was not a very impressive result mostly due to me getting a cold after a few days and then had to go slowly a few days. One day I just sat by the stove drinking tea all day, but the start of the visit was nice and things again improved in all ways toward the end, so on the whole I am still happy with the vacation. 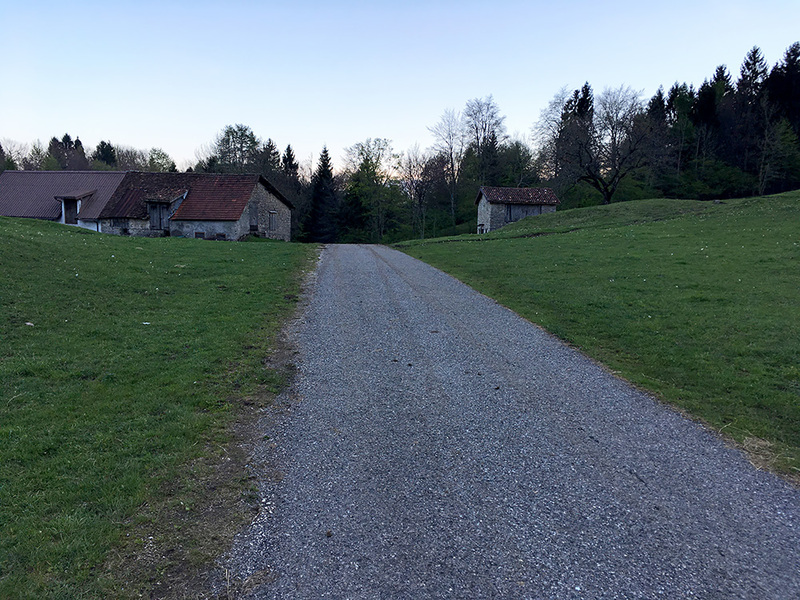 From April 30th to May 9th I got to see most of the places I had hoped to visit this time. 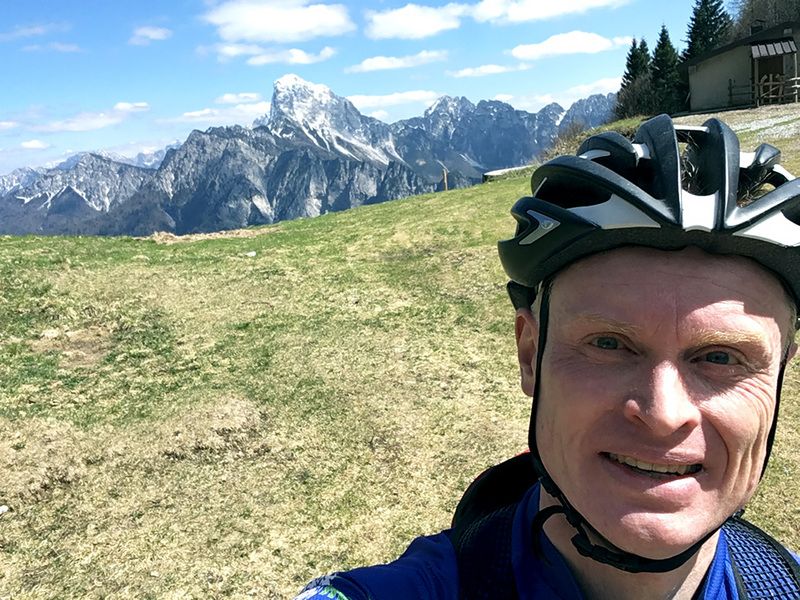 I had also wanted to revisit some great climbs, like Monte Zoncolan and Monte San Simone, but had to focus on the climbs new to me. 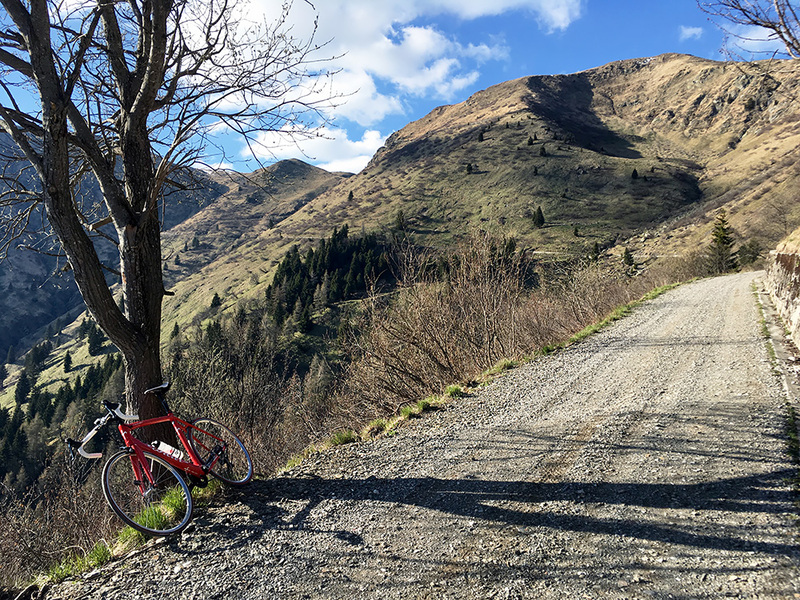 After a little up and down on the minor road from Moggio to Ovedasso I got down to Moggio and took the main road to Tolmezzo (318m). The little bridge from Moggio on to the road to Ovedasso that collapsed some years ago has still not been restored and thus I had to cycle like 500m on gravel every time back and forth. 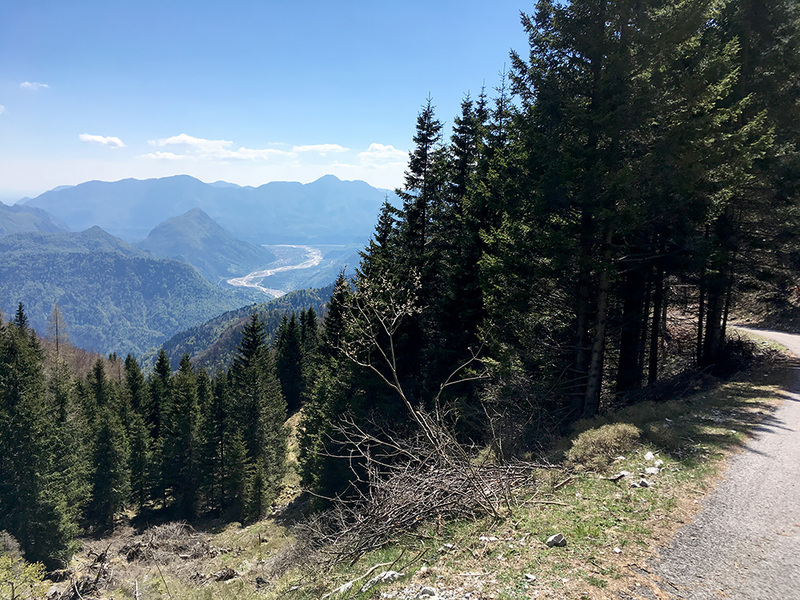 This little road is even in the salite.ch list of climbs as it is quite a hilly and steep little road overlooking the motorway and the old main road up to Austria. I stopped at some place after Tolmezzo for a little coffee. The day was sunny and the weather was perfect. I was soon in Cedarchis (401m) where I took as planned the little road through the little village that eventually meet up with the slightly less narrow road going up the mountainside above the valley road to Paularo. The photo here is from the small road through Cedarchis. 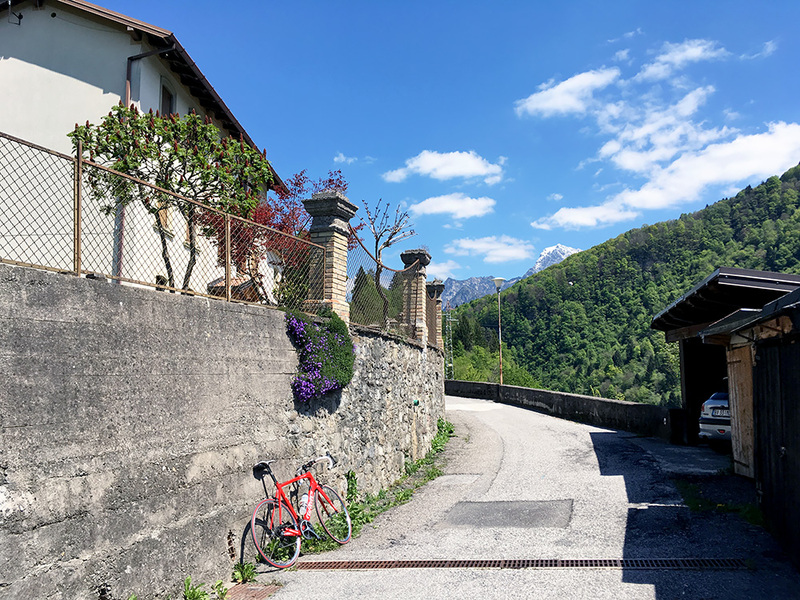 I continued along the winding road until a first turn-off for Rivalpo but that road was sort of closed or simply not used, so continued as planned to a place called Rosa dei Venti (just like the B&B I stayed at, but guess it is a common name). Here a nice serpentine road climbs up to Rivalpo. There are two roads up the the church above Rivalpo and I took the road through the little village. Above the church the road becomes narrow, but it is still fine for a while passing by an oddly placed football area, but possibly the only little place where it was flat enough around here. Thereafter the road surface deteriorated, but it is all asphalted, which I was not certain about. After the road did not climb so much for a while one got to a clearing and some more houses where the road started to climb more and after leaving the houses one is on the final climb to Casera Valmedan alta (1566m). From here on it is a very steep road that improves as one comes higher up, but the steepness only gets worse until the end which as usual is a bit higher than expected. 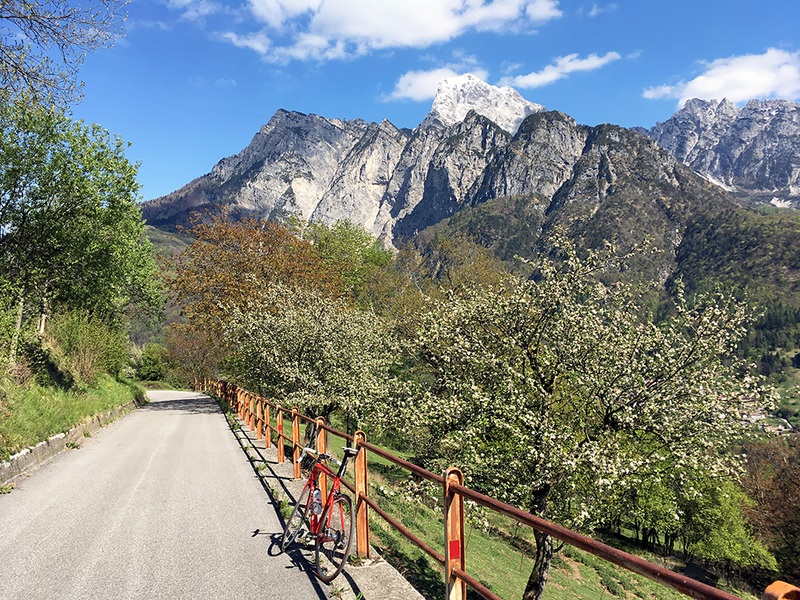 I am not sure I had done this climb if it had been at the end of a long day of climbing, but I also knew from the profile at salite.ch that it would be a tough one (one of the toughest climbs in Friuli in fact, which is also the area with most steep climbs maybe in all of the world). Almost 3 km close to 15% on average. Really tired when I reached the end of the asphalt in the photo above. And here I am up by the farmhouse and some really great views. Have been to places with less good views! It felt a bit like sort of made the rest of the visit a bit boring now that I could not quite hope to get as good views again, but I knew there will be many very nice places left in the area, so as long as the weather would permit it, no big fear here. no problem cycling up the short gravel road to the top of the pass-like looking area. Oh well, had to take a little selfie here (not so good with the front camera though and tricky to use the back camera, but it is possible, of course). Time to go back down. Here a photo from the steep upper section where also the asphalt was best. Some good views down the valley to Cedarchis and Tolmezzo. Had to stop in the early steep section in the woods where the road was not very good, but it is a quite nice climb. Lovely views also from the church in Rivalpo. Here I took the slightly hard to notice alternative road down (going straight down to the right in the photo, while the normal road goes to the right). 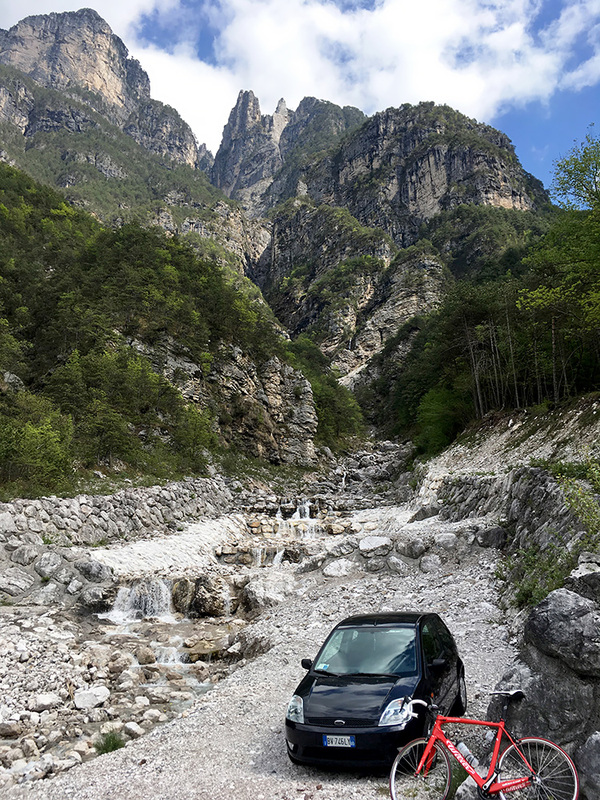 Here I am down on the nice main road to Rivalpo, but one has to be a bit careful descending with a few drainage gullies and somewhat steep serpentine road. Feels like it was very much the right time of the year to visit this place as it was not too hot or too cold and spring had definitely arrived (not so definitely in some other place though). 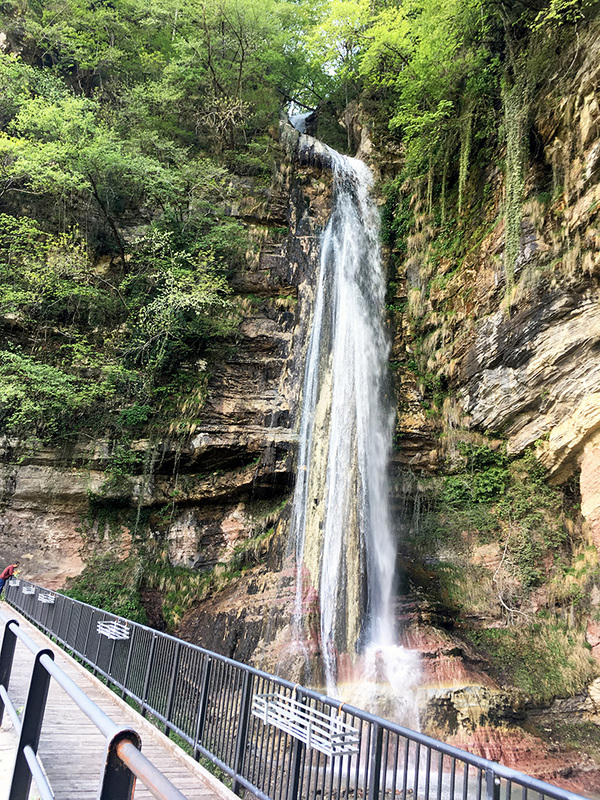 I continued on the high road to Paularo and to my surprise passed by this nice waterfall – Cascata di Salino. I usually do not stop to take photos of waterfalls as they always disappoint when looking afterwards on photos, but this one looks reasonably nice still. Soon the road descended (some roads climbed up the side and looked inviting, but maybe another time). I had planned to go up the other side of the valley from Paularo to Ravinis and Malga Pizzul, which should be another steep climb (no surprise), but even though I had nothing much to complain about thus far, my original plan was just a bit too ambitious for this day and I had already suspected that in planning, so no hard decision this time. I stopped at the bar in the centre (called In Dal ‘Palač’ from what I can see in Google street view). I had a beer and a croissant. Another cyclist came by on a fancy Trek bicycle but did not say hello. Otherwise I saw no cyclists this day. Time to get going on the next climb where I also unfortunately had realised that I would likely not get all the way up as the climb to Monte Paularo is a long gravel road at the end and it should be of dubious quality. Still I wanted to see how far up I could easily go and it should be a good climb by itself. 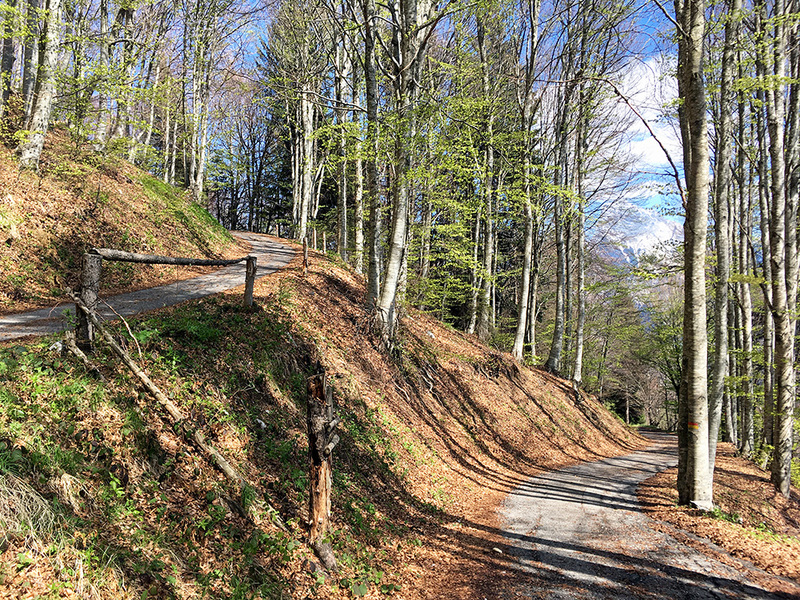 Now, the road up to Forcella di Liûs (road height 1069m) from Paularo (648m) starts quite steep at once. 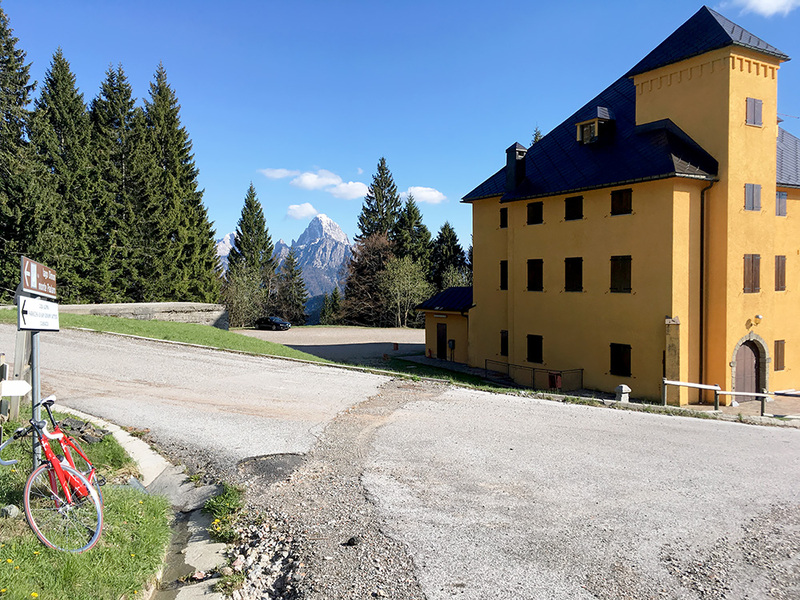 After a little descent to the pass (1003m) the road then climbs again and at the next top (1041m), before it descends abruptly to Paluzza, a road takes off up to Castello di Valdaier/Valdajear (1344m) and Monte Paularo. From the castello in the photo here, the road looked like it was not really possible to continue on at all and one could go slightly higher on better asphalt in the other direction here. After some reasoning and looking at the clock, I decided to go up a bit and see if the road maybe improved a little as I had seen it should be asphalted a bit longer. They were working a little on the road, but not sure that was for anything else than leading off water and clearing some debris, but likely the first part is being maintained a little and possibly it could be easier at the start in the years to come. The road improved a little and I could continue the short stretch where it was partly asphalted. 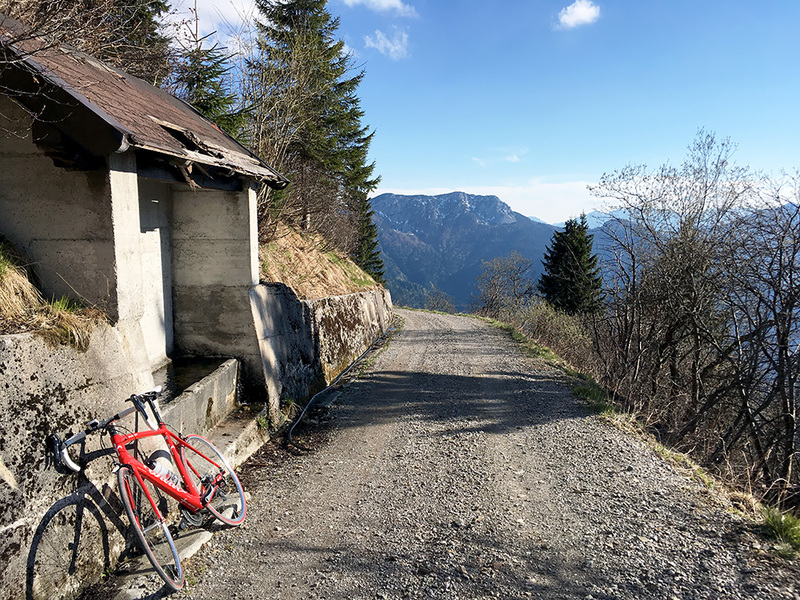 Now the all gravel road starts at a boring place (1430m) with no views in the woods, so decided to push on and maybe reach the fountain I had seen some photo off around the next corner of the mountain. I proved to be a bit to go and the road was just about possible to use with a road bike. Eventually I reached the place, but it was a little longer than I had thought. Here however the views improved dramatically and I could not resist going a bit further still to get a view of the legendary last part up the mountain where there are some spectacular hairpins, but hard to see it looking spectacular from below. Still I had to be reasonable and the road was surely not improving, so decided when I got clear views up the rest of the climb that this would have to do if I should be back without a flat and in time before the dark. I stopped at ca. 1626m height. The road looks reasonably good here in the photo and it was better here than just before on a steeper stretch, but it was still rather gravelled with much stones, so very slow going. Hard to see in the photo here, but one could see the serpentines going up in the distance here. 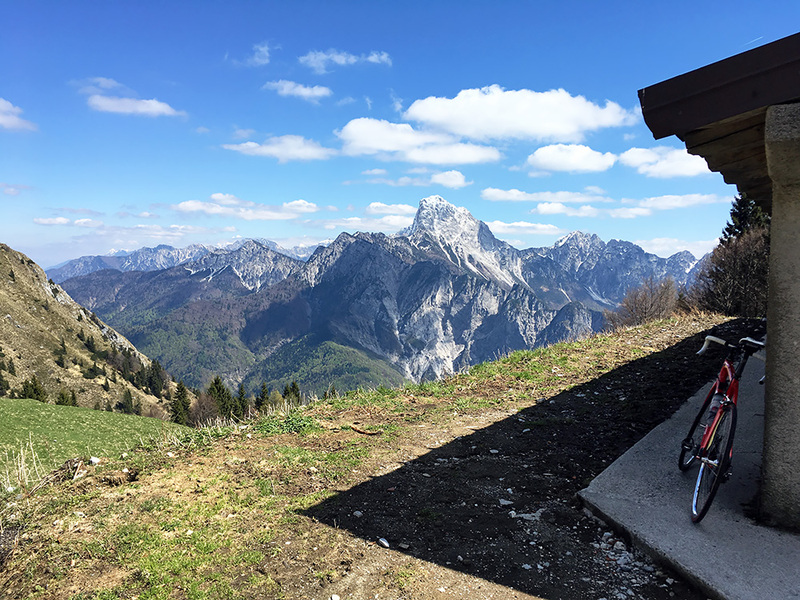 A perfect climb for mountain bikers or even cyclocross cyclists, but maybe not with a road bike unfortunately, unless maybe if you have really fat tyres that starts to get popular even on road bikes or a special so-called “gravel bike” ;-). It was now starting already to get a bit late, but otherwise it was quite nice up here and if I had been up earlier, maybe I would have pushed on even further up. It was a good idea to descend before it started to get cold though. Once I got back down to Castello di Valdaier/Valdajear it was a nice descent to Paluzza. From Paluzza I followed the main road coming from Austria and the Plöckenpass/Passo di Monte Croce Càrnico (1358m) (where the road is much worse on the Austrian side). 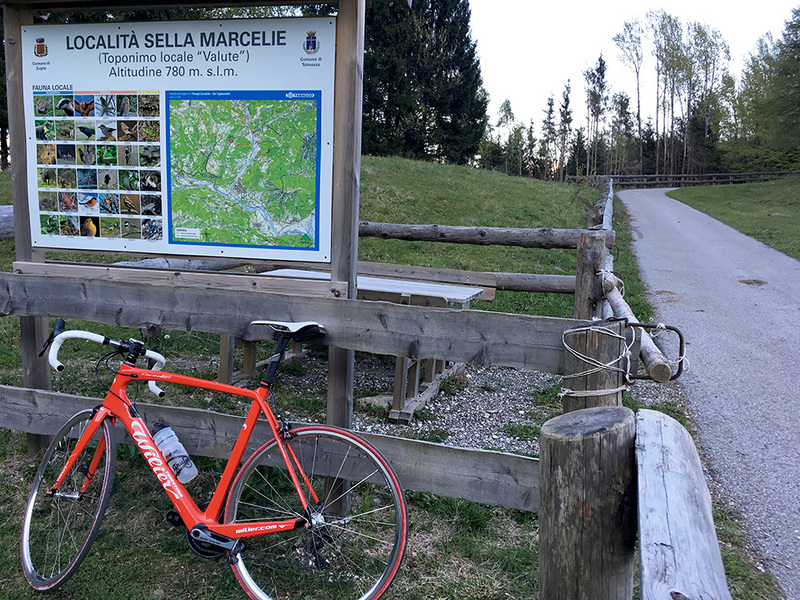 Just before coming back down to Cedarchis, I took off to Zúglio (411m) where a classic climb to the minor pass Sella di Formeaso/Marcilie (780m) starts. I thought this was a much used road as I got the impression it is a classic cycling pass in the area, but there was almost no traffic and the road was not properly cleared from debris higher up. The road is very narrow after reaching Sezza but less steep then. 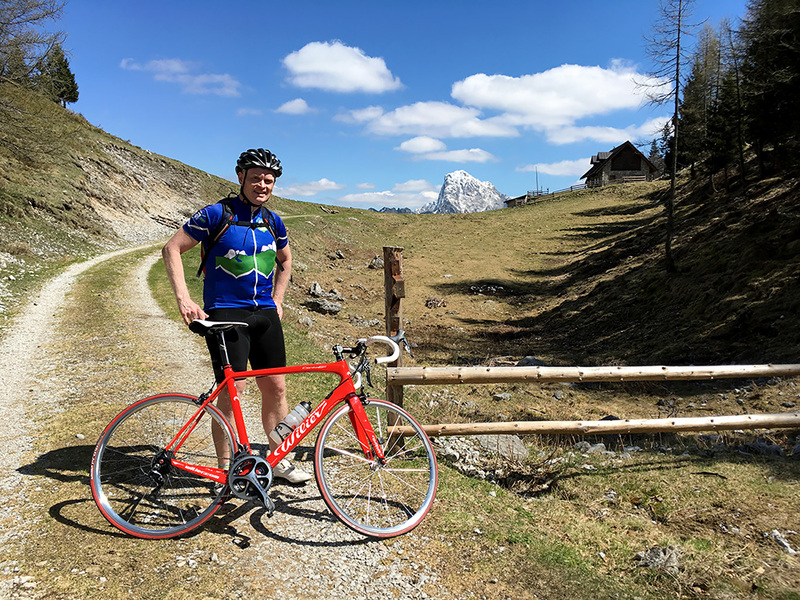 After starting the descent on the south side and reaching the Cazzaso Nuova village I stopped for the photo below over the area around Tolmezzo. Only as I continued out of the village there was a sign that the road was closed. That was a little late for turning around. However, such signs in Italy should not always been taken too seriously and usually means only that the road is damaged in some way (or that they do not want other than locals using the road, as one could suspect at times). 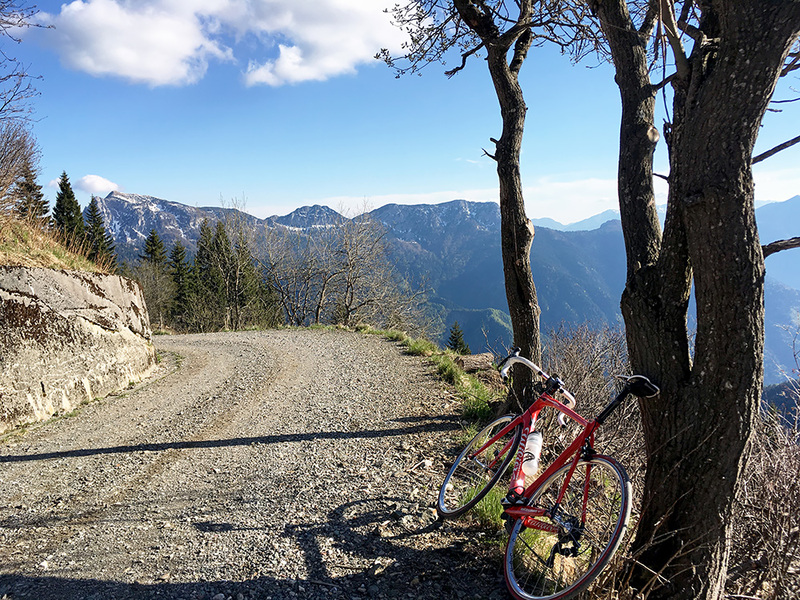 It was all fine to cycle on and got out on the Fusea road down to Tolmezzo. 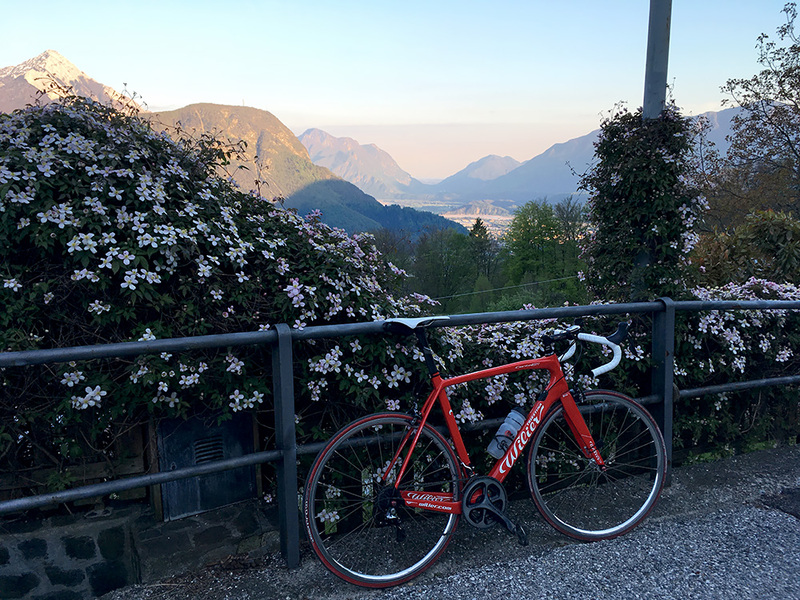 A lovely day and a nice ride back to Moggio in the evening with a good dinner awaiting me for the evening. I had noticed the weather might turn worse later on according to the forecast and thus had to reschedule the days I had planned and do the most important ones first and trying to go in the right directions according to the weather. This mostly succeeded and that possibility to reschedule planned days is a good thing about being stationary rather than following a tour plan.